"I have spent all my youth years in homeopathy." for giving best of homeopathy to my patients. 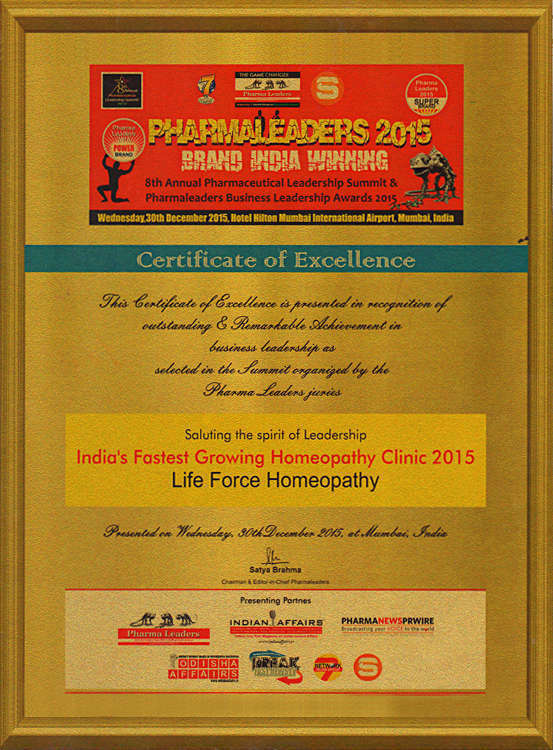 Life Force is a world leader in homeopathic practice. Life Force is run globally by Life Force Molecules Pvt. Ltd globally and run by Homoeopathy India Pvt. 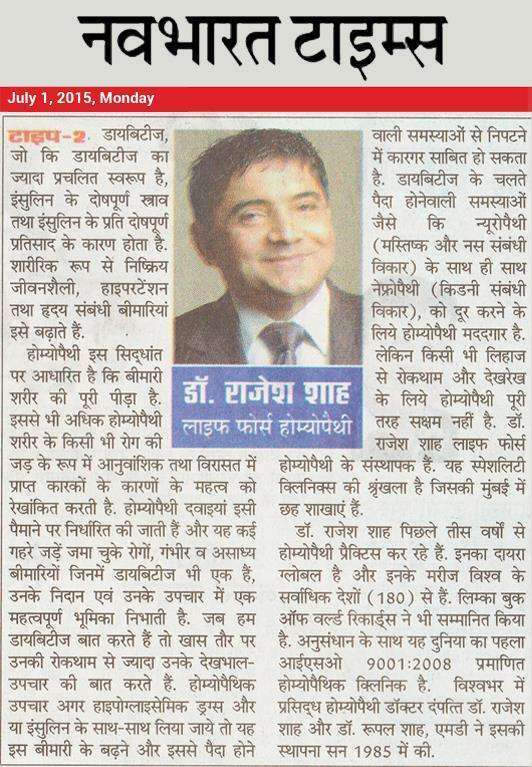 Ltd. (HIPL) in India, under the direct care of Dr. Rajesh Shah, M.D. and Dr. Rupal Shah, M.D., globally renowned homeopathic doctor couple. Life Force is amongst Asia's largest homeopathic clinics, currently treating patients from over 160+ countries (an established world record). 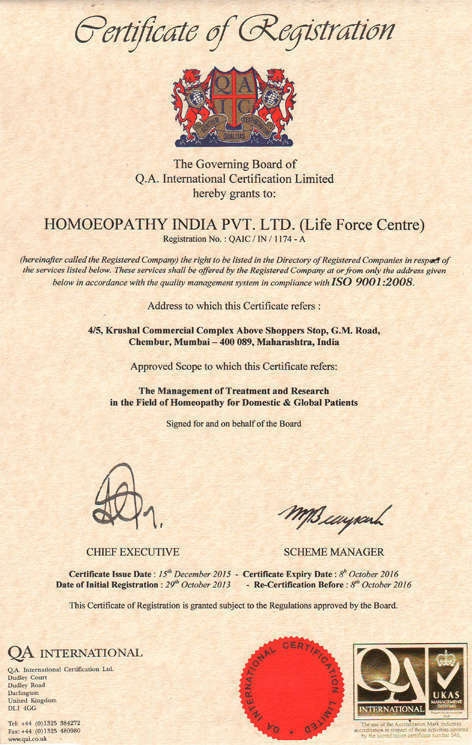 Life Force is worlds first ISO 9001:2008 certified homeopathic clinic with an attached research wing. We have been practicing ISO modalities since 2002, which has made our system much more quality conscious than most others in the world, in the homeopathic practice category. There may be several ISO certified clinics but Life Force is one which is one which has an ISO certification for the clinic with a research wing, which is unique. Life Force would like to humbly take credit for being able to spread the benefit of homeopathic healing to thousands of families, all over the world. Life Force is working hard to augment the work base, as the task calls for spreading the message of homeopathy to people in every country, every city and every village across the globe. The organization is involved in the areas of global practice, international promotion of homeopathy, education, and research. Life Force has been actively involved in promoting homeopathy all over the world. People from over 170 countries have been reported to receive scientific information on the role of homeopathy for various diseases, through 20+ websites launched by Life Force giving insights into homeopathy. The homeopathic medical education is a significant part of Life Force. Clinical Training courses have been conducted by Life Force in the last thirteen years in England, USA, Ireland, Sweden, Norway, Japan, Croatia, etc. Seminars and workshops have been conducted in Belgium, Holland, Greece, Czech Republic, etc. Intense training courses have been conducted every year since 1994, at our centers in Mumbai, which have been attended by doctors from Russia, Egypt, South Africa, Australia, England, Canada, Sweden, Laos, Ireland, USA, etc. Various research projects in the field of scientific homeopathy have been carried out and research has been an ongoing process at our organization. Research in the areas of scientific investigation, newer medicinal measures, fundamental research, clinical trials, and statistical studies form a vital part of the scope of Life Force. Life Force is setting up a global network of homeopaths whereby classical and scientific homeopathy could be promoted.